William McDonald, Frank McDonald, James Wright, Frank Taberner, David Benzie, Robert Murray, Dr Simpson, Inspector Mc? 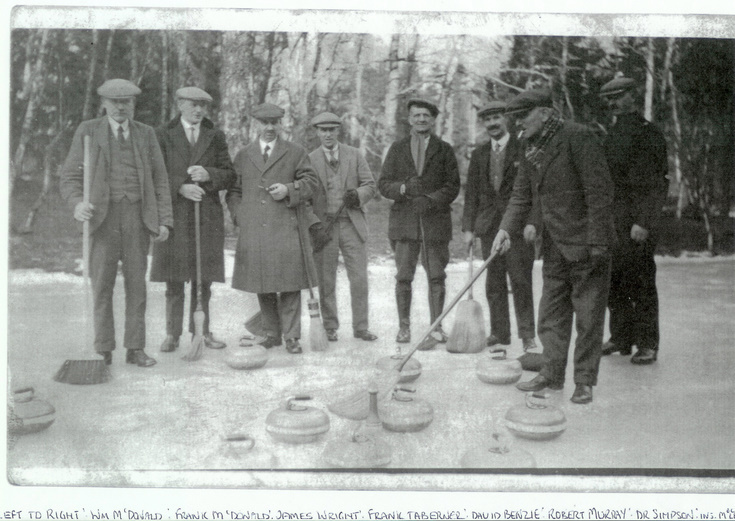 Oh but there was fun, a plenty, to be had on that curling rink. I wonder if my dad's jet-blacl stones are still there? William McDonald, meal miller, Montgarrie? James (JJ)Wright, merchant,Victoria Bldgs,Alford?Robert Murray, of W&R Murray,Coachbuilders,Alford? Better off chiels, with more time on their hands for the bonspiel. Note the collars and ties.